Modern smartphones are being constructed with increasingly tougher types of glass. But accidents happen, and people drop their phones every day. Even if you already have fairly impressive glass to begin with, like the extra sturdy build of the Samsung Note provides, then you’re still going to want another layer of protection. If or when an accident happens, it’s far better that your screen protector to take the damage than your Samsung Note. For protecting your Samsung Note, you’ll want to be certain the protector you choose was made specifically for the Note. Many screen protectors are knockoffs, originally manufactured for other phones, and then resold as being made for whatever new device comes out next. Some of the most prominent and egregious examples of this occurring happened to owners of the Samsung S9. 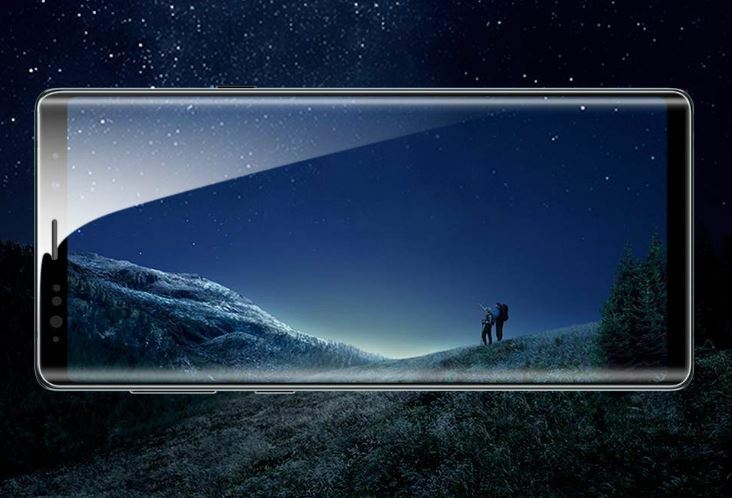 Those knockoffs were particularly hazardous to S9 owners because of its extra-large screen size, not to mention screen curvature issues. If you end up with a screen protector that doesn’t fit perfectly with your device, the result isn’t simply poor aesthetic. You end up with mediocre protection, and can often lose sensitivity along the edges of your device. In other words, you can be almost worse than you started off. Protecting your screen can generally be done in one of two ways, plastic or glass. Your standard polyurethane protector has many things going for it. It tends to be cheap, and it adds essentially no additional weight to your phone. But they’re also ineffective defense against more than extremely mild scratching. Against pressure, they do virtually nothing. And plastic protectors can be difficult to the point of being outright intimidating, at least if you don’t want to look at bubbles trapped under your screen. By contrast, glass protectors are somewhat heavier and somewhat more expensive. But people prefer them because they’re quite durable. Properly constructed, tempered glass is capable of withstanding small impact and direct strikes. And tempered glass is also constructed in a way that, should it break, the shards are not likely to cause injuries. Many manufacturers advertise their glass protector is rated with what’s called 9H hardness. 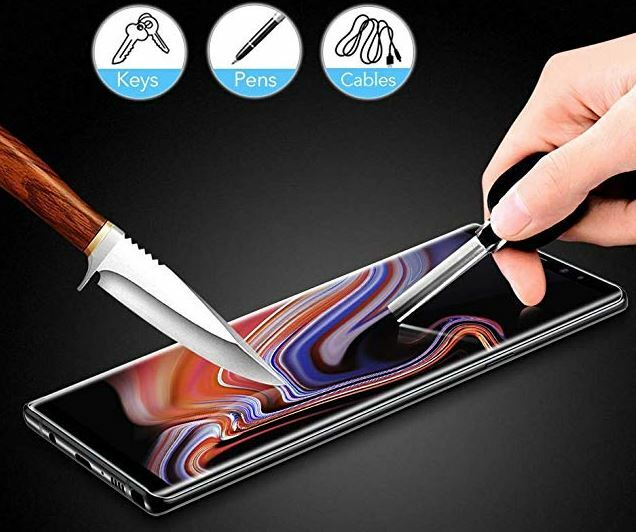 Samsung Note screen protectors which have this rating are supposed to be able to withstand contact with the hardest of all pencils, the 9H. Clearly this isn’t a very good test when it comes to real-world application. But it does let you know the manufacturer took the time to test, and provides you a good approximation of the protection available. What portions of your screen are actually protected? Many glass protectors can actually reduce the overall integrity of your smartphone’s protection. That’s because they’re erroneously built marginally too-close to the edges of a screen, which can change the vulnerability areas of your phone during a fall. What glass screen protectors for the Samsung Note do provide is defense against the sort of everyday scratches and small drops that people tend to encounter. They’re good for having keys in your pocket with your phone, and not ending up with a horribly disfigured phone at the end of the day. And they’ll be able to help you out if you happen to drop your phone face-down onto a concrete sidewalk. But sometimes a screen protector may survive a fall where your phone does not. In just about any drop, the most vulnerable portion of your Samsung Note will be its corners. Your screen protector may not help with that, but it can actually hurt if it’s improperly installed or constructed slightly too large. Anyone using a screen protector will have to think about the sensitivity settings for their Samsung Note. Using a screen protector can interfere with the sensitivity of your hone because more material is added between internal sensors and the user’s finger. If the Samsung Note’s glass screen protector was made for protecting your phone specifically, then these types of problems should be only minor adjustments. However, you will want to be ready to open the settings window and adjust the sensitivity of your screen before adding the glass. If you manage to choose the right protector and remember to adjust sensitivity, the only other thing you need to worry about is making a clean installation. And that’s usually as simple as using the included cleaning and preparation supplies any of the best tempered glass screen protectors for the Samsung Note will provide. Smudges are worth a look because you hate looking at them. After all, the whole idea behind a screen protector is to make sure your phone continues to look its best. When you’re using a protector that’s prone to drawing smudges or glare, that can be as bad as having scratches straight on your screen. Layered on fingerprints can even interfere with screen color. Any decent tempered glass screen protector worth your time will include some variety of anti-smudge protection. Sometimes you need more than basic levels of protection. For those times, there’s the ESR Tempered Glass Screen Protector. It’s perfectly designed for the Galaxy Note 9. And ESR has constructed this protector from shatterproof 9H-protection tempered glass. 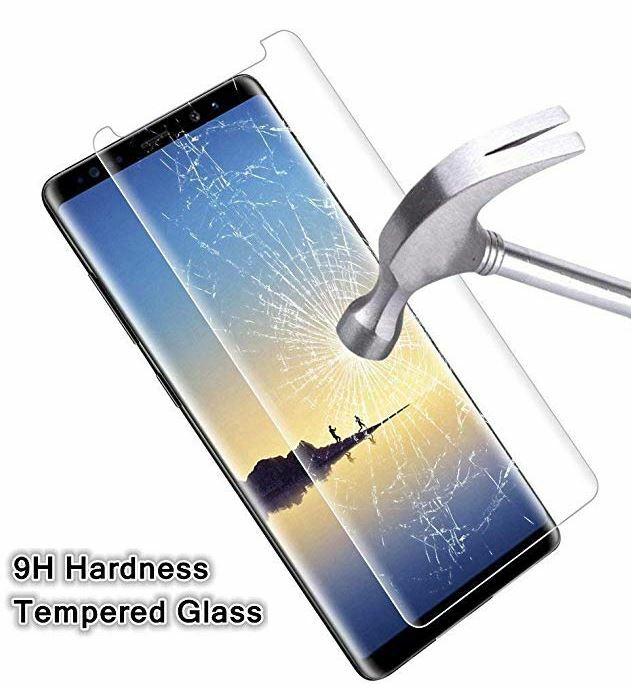 That provides adequate for protection against common scratches and drops from the Note 9, as well as some more aggressive and forceful varieties of damage. The ESR Tempered Glass Screen Protector is 0.26mm thick. That’s on the thin side for screen protectors, but it’s still enough to provide sufficient protection. And the slightly thinner design of this protector helps keep the native feel of the Samsung Note touch interface, as if the protector wasn’t on at all. Another thing to note is how 99.9% light transmission allows for the naturally rich colors of the Samsung Galaxy Note 9 come through without interference. That’s furthered by an anti-fingerprint design to help keep the protector clean of water and oil. Those protections which are managed through the screen being coated in a hydrophobic coating, which also makes the screen principally simple to clean and wipe down. The subtle 3D-design of this protector won’t interfere with the Face ID feature of the Galaxy Note 9. Installation takes about 30 seconds, and no extra tools are needed. The bubble-free adhesive just requires that you align the protector and then press firmly. And the sizing of this tempered glass screen protector ensures it aligns easily and naturally with the note. Once applied, the laser-angled edges of ESR’s protector prevent dusted edges and ensures the protector will work with most types of smartphone cases. 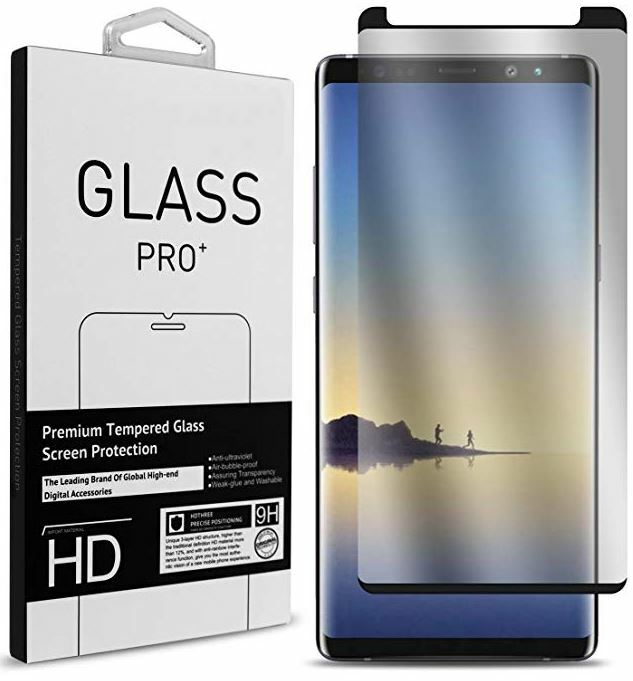 This protector includes one dust removal film, an installation guide, one alcohol wipe, and one tempered glass screen protector for the Samsung Note. The guide isn’t anything particularly useful, but the inclusion of the removal film and alcohol wipe provides everything you need to make a clean installation look great. ESR also includes a lifetime warranty for their protector. 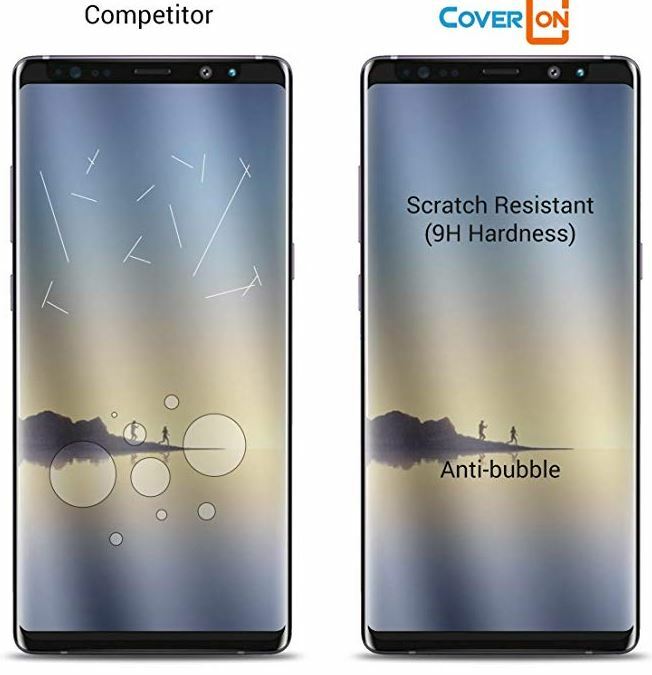 When people see tempered glass screen protectors that are as inexpensive as the CoverON Galaxy Note 9 Tempered Glass Screen Protector, they start to become suspicious. People even start to think it’s possible they’re buying plastic that’s been incorrectly advertised. But the CoverON Galaxy Note 9 Tempered Glass Screen Protector is actual tempered glass. And it uses a premium-grade design that makes use of multiple layers for added protection. The CoverON Galaxy Note 9 protector lists capacity for protecting the Samsung Note from objects of 9H hardness, but the glass seems substantially tougher than that. Physically speaking, it’s constructed to provide complete coverage for the front-facing side of the Galaxy Note 9. 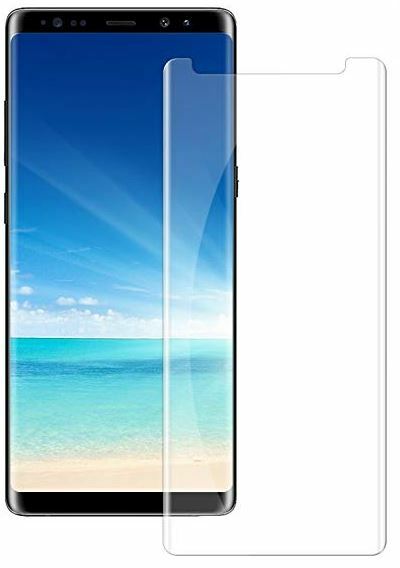 The tempered glass is 0.24mm thick, making it slightly thinner than that used by the ESR Tempered Glass Screen Protector, and adding only about one ounce of weight to the Samsung Note. As with ESR, this thinner build helps to maintain the native touch feel of the Note. But more than that, this protector provides ultraviolet protection for your screen. And it’s constructed with an oleophobic coating which helps protect from oil, fingerprints, and smudges. You wouldn’t want to go as far as to dunk your Samsung Note in a river, but once the glass protector has been installed, you usually don’t need so much as a wet cloth to clean up the messiest screen. It’s worth paying attention to the fact this protector is made specifically for the Samsung Galaxy Note 9, and is not compatible with older versions. And the adhesive is a relatively weak glue which can be safely washed off your Note 9, should you need to change it. The edges of the glass provide a case-friendly angle to the bezel, which won’t work with every case in existence, but will certainly work with most. While you won’t get much help in terms of instructions for installation, the two-step process ensures the application is air-bubble-proof. CoverON includes an alcohol wipe to help quickly and easily install the protector, as well as a 90-day warranty. 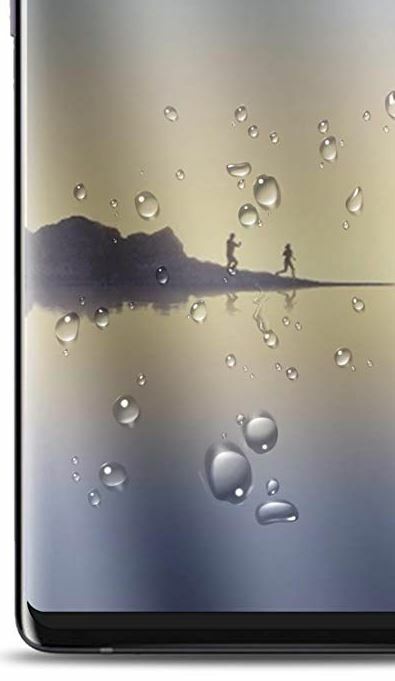 The Acedining Galaxy Note 9 Screen Protector is a privacy screen protector. Unlike typical screen tempered glass screen protectors for the Note, this protector incorporates an anti-spy design. But like those other protectors, this selection supports anti-scratch 9H tempered glass, and all the basic protections your Note needs. Holding the glass in your hands, you’ll notice this is a slightly denser Samsung Note glass protector, and consequently adds about 1.5 ounces of weight to your phone. Its 28mm thickness provides as much protection from scratches as it does from gouges. It’s also made to resist oil stains and fingerprints, with the same oil-repelling spray used on any of the best tempered glass screen protectors for the Samsung Note. With respect to privacy, anti-spying features are made possible by hacking down on the viewing angles form which you can see what’s on your smartphone. 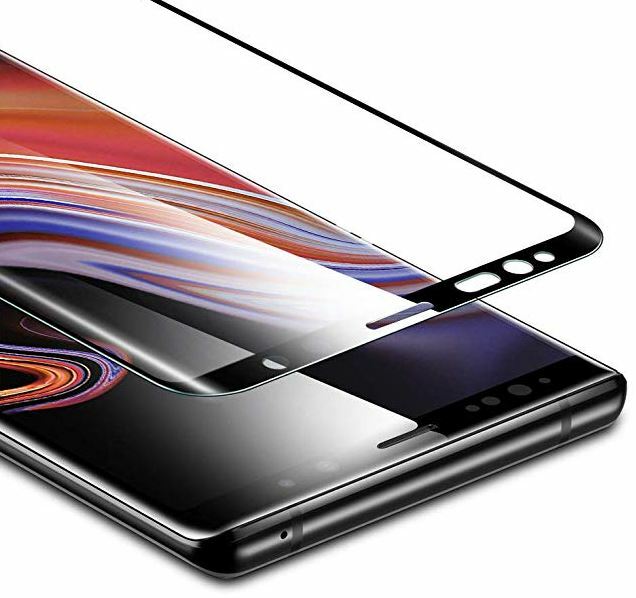 The Acedining Note 9 Screen Protector maintains visibility within a 90-degree range around your display. The protection is such that unless someone is directly beside or behind you, it’s extremely difficult to see anything on your screen. 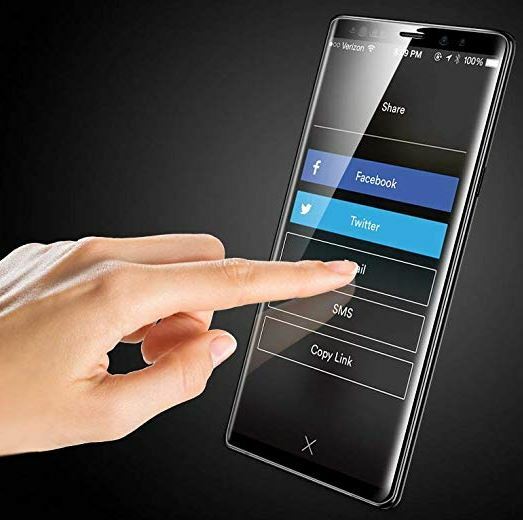 Screen protectors provide this anti-spy functionality by filtering the light that escapes your Samsung Note S9. Brightness goes down, and the vivacity of colors may be slightly reduced. Dimness issues are not severe while using this protector, but you can turn down your brightness to increase privacy levels. You won’t get quite the same color vivacity as with the native Galaxy Note 9, but the spy protection can be a worthwhile compromise. 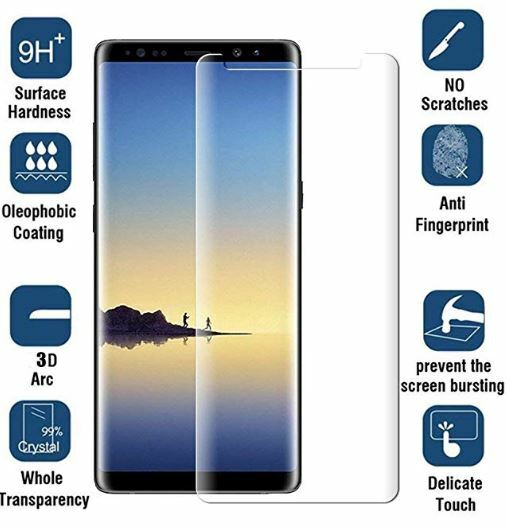 The Acedining Galaxy Note 9 Screen Protector uses a bubble-free installation, and they provide a lifetime warranty and satisfaction guarantee. Small bubbles may appear, but the self-healing nature of the installation will help those bubbles disappear within two days. Additionally, it includes a wet wipe, dust removal sticker, cleaning cloth, and the screen protector itself. The ESR Tempered Glass Screen Protector is a good choice for its universal acceptance of Samsung Note smartphone cases. If you’re worried about being able to keep your favorite cases in-action while using a new glass screen protector, the ESR protector is your best way forward. ESR also has that lifetime warranty, which is icing on the cake. The CoverON Galaxy Note 9 Screen Protector is the most lightweight and inexpensive screen protector on this list. It provides essential protections, like anti-oil coating and a generally thick slab of tempered glass. CoverON’s protector is a good choice someone looking for value first and foremost. It’s also got the best native touch control of the three protectors on this list, due entirely to its slim profile. Finally, the Acedining Galaxy Note 9 Screen Protector is the right choice for someone concerned about privacy. Its 90-degree privacy protection is adequate on its own, but can be adjusted to better suit your personal preference. Although some light transmission is always lost with privacy screen protectors, the Acedining Galaxy Note 9 Screen Protector seems to do a particularly good job at maintaining color vivacity. It’s a great choice for people who are worried about privacy.